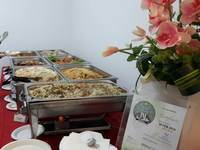 Must have a total of 2 live cooking stations OR 1 live cooking station and 1 buffet order. Included one chef per live cooking station for 3 hours. "A great experience and would order again!" "Thank you so much for the stressfree service!" "The service that Delizio provided was good and ..."